Crack Sealing - Delaware sealcoating - striping - Moore Seal Inc. Properly crack sealing your asphalt surface can save you money. Cracks to be effectively filled must be 1/8 inch wide and 1/4 inch deep. 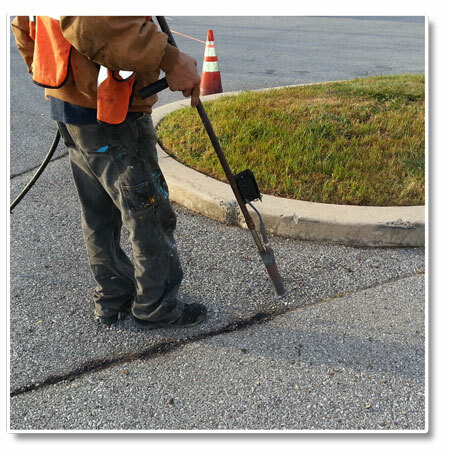 Hot-pour crack sealant is recommended to crack sealing commercial parking lots. These products have been found to far outperform cold applied sealants; however cold crack sealing can effectively be used on residential driveways. Crack sealing is the most important part of asphalt maintenance that you can have done to extend the life to your pavement. This prevents water from running through cracks which can weaken the base causing further cracking due to the freeze and thaw cycles. Prior to crack sealing, the surface is cleaned using power blowers, along with hand brooms, shovels, etc. Vegetation will be removed from cracks using a crack jet and or pressurized air and brooms. Cracks shall be cleaned and filled before filling cracks, if this work is accepted in the contract. Moore Seal can handle any job with any job with any amount of cracks to be sealed. Whether you have a driveway or a large commercial parking lot, Moore Seal focuses on any and all jobs. Allow Moore Seal to come and provide any of your crack sealing needs and let us help you expand the life of your asphalt.